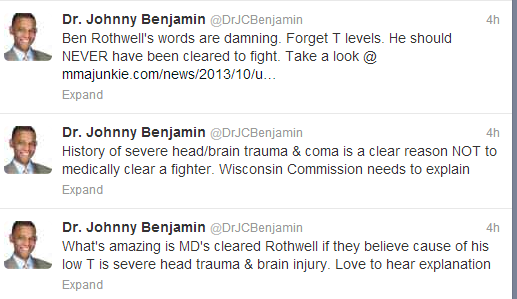 Yesterday I questioned the Wisconsin Department of Safety and Professional Services’ decision to uphold a win by Ben Rothwell after he tested positive for elevated TRT. Dr. Johnny Benjamin was quick to identify a more important issue, the fact that a licence was issued in the first place. Rothwell was granted a Therapeutic Use Exemption for Testosterone Replacement Therapy. While there is a live debate about whether a fighter needing TRT in order to address an underlying medical condition should ever be cleared to fight, Rothwell’s circumstances are particularly troubling. “I had applied for TRT after an endocrinologist and Wisconsin athletic doctors diagnosed me with hypogonadism. They felt it was caused by a car crash in 1999 that left me with severe head trauma and in a coma. Doctors told me TRT was something that could stop the hypogonadism from degrading my body. Athletic Commission’s exist to regulate combat sports first and foremost for participant safety. Taking a look at the Wisconsin Department of Safety and Professional Services, they are tasked with licencing combatants and pursuant to SPS 196.01(3)(i) are supposed to deny a licence to any applicant who “Is not physically fit to engage in professional mixed martial arts competition“. Brain trauma is cumulative. Negative MRI’s and CT Scans are not conclusive proof that a fighter is fit to be licensed. If a combatant, by self admission, sustained historic brain trauma of such severity that there are lingering health consequences over a decade later with objective diminished capacity an Athletic Commission is on questionable footing if they choose to licence such an applicant.